Before I start I told the Noob Spearo guys that I would keep this article as simple as possible. This article will cover the most important subjects that I believe any freediver or a spearo should be aware of when wanting to achieve spearfishing at 20 metres and beyond. Spearfishing at 20 metres has been a magic number for beginners in freediving or spearfishing, so what happens at -20 meters and how your body reacts to it is important to know. Freedivers and spearo’s will both experience the same thing at this depth which is the effects of pressure. Which parts of our body gets effected by this pressure? Yes, you are right, the first answer is lungs! But think with me, do you really think this is the only organ that can be affected by pressure? Let me put it this way, any organ in your system that contains air must be equalized unless it is protected by bony structure. This means that there are other organs affected by pressure so let’s have a look at them. 1: Lungs and the blood shift. In 1974 the legendary freediver Jacques Mayol conducted a medical test. The test was to take a blood sample during a dive, so a catheter was implanted into his elbow to allow the doctors to measure his blood pressure at depths of 40 and 60 meters and it was noticed that the quantity of the blood contained in the lungs increased from 1 liter to 2.2 liters. Simply put, his blood shifted to the lungs to protect them. This concept is what we now call blood shift. In this image you can see that the blood is recalled from different zones in the body where there are no vital organs and it is pushed into the lungs to fill the empty space that has been created by the reduction of air volume due to the increased pressure. At -10 meters you can see the amount of the blood has been increased in the lungs and also how your lungs will look at – 20 meters, now let me ask you this. Why does our system use the blood? The answer is; Blood is liquid and liquid is not affected like air under pressure! 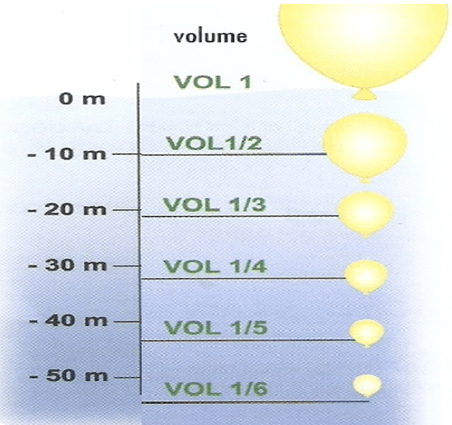 From this image you can see that the air volume in this balloon is equal 1 at sea level then at 10 meters it is reduced by half and at 20 meters it is further reduced to 1/3 of the volume than it was at the surface. This is how much pressure your body will be under! So please do not underestimate such a depth, learning the correct technique of freediving will help you to improve and understand diving at depth in a safe way . The cranium also contains several airspace’s (Laryngeal, pharyngeal, sinuses and middle ear). Some of them are constantly open because they are surrounded by bony structures which guarantee the constant air flow through them. Others like middle ear Eustachian tubes are composed of cartilaginous tissues which are collapsible when exposed to pressure. Therefore we equalize the eardrum or you will feel serious pain if you do not equalize. To make it simple guys any part in your body that contains air must be equalized unless it is surrounded by bony structure. 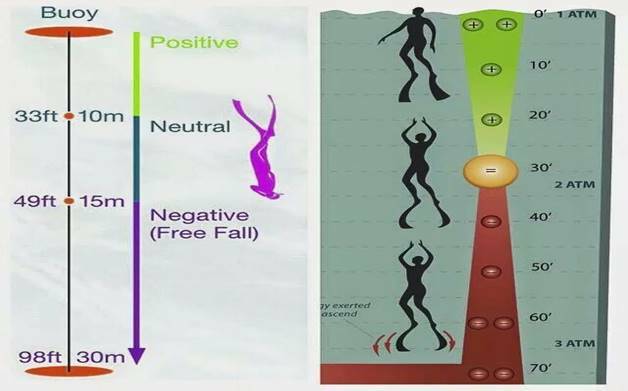 According to this image it shows the diver becoming negatively buoyant at 15 meters and that’s when we start to freefall, which means we do not need to kick anymore to reach the bottom. This is completely dependant on how much weight you have got on your belt, some people that are over weighted become negative buoyancy at 8-10 meters and the main reason for this is a lack of knowledge. The second reason is that many divers think that it is easier to get to the bottom, which is correct but should be considered alongside getting back to the surface. Some divers use much less weight so that they will only start to free fall or become negatively buoyant at 25 meters and here we are talking about deep free divers. I hope my explanation was easy enough for everyone and it was straight to the point without being too complicated. Dive safe and enjoy the blue guys! Ayman is a Freedive Academy Australia Instructor with a wealth of experience in both freediving and spearfishing. He is also the Queensland distributor for Meister Diving equipment and now a Noob Spearo contributor.